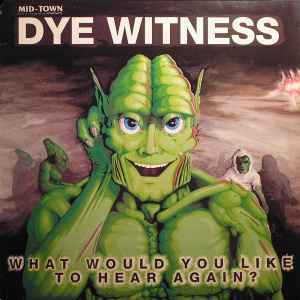 Dye Witness* ‎– What Would You Like To Hear Again? "What would you like to hear again" was a massive anthem in the Sydney rave scene as well up and down the eastern coast. Played to death by almost every major DJ. What would you like to hear again ? is a bouncy happy techno song that is a slower tempo than the other three songs. I Am The Creator is the highlight of this EP. Starts with air raid sirens and leads into a strong beat with some breaks. Ty-Rap and Spirap are standardish gabber tracks. In my opinion I am The Creator is a stone cold classic gabber track and anyone who loves gabber should purchase this record.